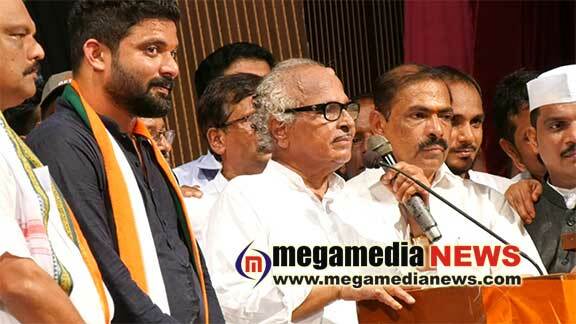 Mangaluru : The gathering at Town Hall in Mangalore witnessed the statement of Former KPCC president and veteran Congress leader B Janardhana Poojary before filing the coalition candidate from the Congress, Mithun Rai on Monday. Poojary vowed that he will never visit Kudroli temple, Ullal dargah and Catholic churches if coalition candidate from the Congress, Mithun Rai, does not win in the Lok Sabha election. Poojary, who had earlier blessed BJP candidate Nalin Kumar Kateel on Sunday, said coalition candidate Mithun Rai will win. “It is a blissful day for Dr Mahabala Rai, who is the father of our beloved candidate Mithun Rai. Last night, when I was sleeping I felt like someone slapping me on my chest. It was the deity of Kudroli Sri Gokarnanatha temple, who told me that Mithun Rai will win. I have told this in the temple too and there is no need of lying for me. It was the idol installed by Brahmashri Narayana Guru who decided to field this candidate (Mithun Rai). If I lie, I will be punished or my family will have to bear the brunt. Hence, I assert that Mithun Rai is blessed. He will win,” said Poojary, who was the Union minister in Indira Gandhi and Rajiv Gandhi governments. On Sunday, Poojary had told media persons when sitting MP and BJP candidate Nalin Kumar Kateel visited Sri Gokarnanatheshwara temple and sought his blessings that, “Modi will come to power for next two terms as well and the almighty will bless Nalin.” However, on Monday, he changed his stance by blessing Congress candidate Mithun Rai. If Mithun Rai does not win, I will stop going to Kudroli temple. (Poojary is the chief patron of Kudroli temple and is instrumental in its renovation). Similarly, I have been visiting Ullal dargah and I will stop going there too if he loses. I have been going to Catholic churches and I will stop that too if he loses. God will bless you (Mithun),” Poojary said.